Making things move on the screen using code is one of my favorite hobbies. It is what got me into computers / design / programming so many years ago, and it is what still keeps me there. Most of the time, I just create stuff on my own animations from playing around with some code. Rarely, I re-create static animations that others have created. This is one such rare time. A while ago, the very talented Pasquale D'Silva created an animated GIF of bubbles moving. With his permission, I decided to re-create that animation using code and then deconstruct how it was done with all of you. In this deconstruction, you will learn how I created this animation. You will learn how the big chunks of code come together to create the final result that you see. The goal of this exercise, though, is not just recreating this animation. It is something bigger and (hopefully) more useful. That's not easy, but few things worth doing actually are. Let's get started. If you've never animated anything using the canvas before, this tutorial may be a little bit on the advanced side of things. I do encourage you to read on, but if you ever find yourself getting stuck, check out the Animations in the HTML5 Canvas and Animating Many Things on a Canvas tutorials. The next step is to figure out how to break this animation down. This animation, similar to all animations, can be broadly divided into two categories: how it looks and how it changes. Now that we are done with the visuals, let's look at the changes caused by our animation. Because the circles are moving up while they rotate, this ends up looking like it is wiggling horizontally. These bubbles don't start from the bottom-middle and radiate outward like the initial bubbles that you saw. Instead, they come fast and furious from all over the place. Now that you have an idea of what we are trying to re-create, all that is left is actually seeing how that has been translated into code. As you will see shortly, despite all of the interesting movements our bubbles make, coding it all up is reasonably straightforward. In the following sections, let's look at the code in greater detail. The easiest way for you to follow along is to simply view the source for the Irritated Bubbles example in a separate window, tab, or even monitor. The first four variables are specific to our canvas object and its size. They should be self-explanatory in what they do, and you'll see the canvasWidth, and canvasHeight variables used frequently in our code. In the last line, I declare an array called bubbles. This array will store every single bubble that you create. Yeah...this bubbles Array object is kinda a big deal in our code. Setting up the stage by declaring a few global variables is the easy/boring part. The real fun happens once you start getting your hands dirty with creating the bubble. Besides taking a boatload of arguments, our constructor is very simple. It just takes the arguments that are passed to it and assigns them to properties that live on the Bubble object itself. Each bubble rotates around a fixed axis as it is moving. The radius of this rotation is specified by this argument. Does your bubble tilt left or does it tilt to the right? The value of this argument determines that. 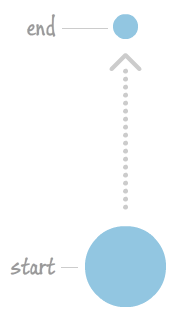 This variable specifies the initial speed at which our bubble moves. This variable specifies the rate at which the horizontal speed changes. This variable specifies the rate at which the vertical speed changes. 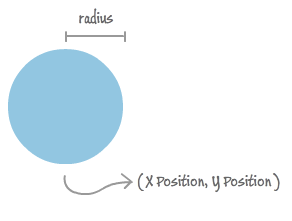 The radius of your bubble is specified here in pixel values. The larger this value, the bigger your bubble will be. As its name implies, this specifies the initial horizontal position of the bubble. The close friend of initialX. This variable specifies the initial vertical position of the bubble. This one is simple. It specifies the color of our bubble. As you can probably infer, the values of these arguments play an important role in determining how your bubbles look and move. You'll see shortly all of these values being specified when we are actually creating the Bubble objects. In fact, you'll see it next! The Bubble object constructor you saw is pretty cool, but it really doesn't have much going for it right now outside being this container for properties we want it to store. Let's take a few more steps forward and actually create the bubbles and put our object constructor to use. In each line, I am creating a new Bubble object and painstakingly filling in all of the various arguments the constructor takes. 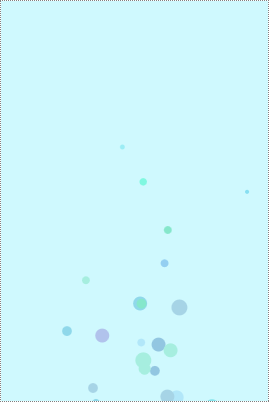 As you will see shortly, much of our code for creating bubbles relies on using random values for all of the bubble's look and animation properties. One of our goals was to ensure that, at the start of the animation, a handful of bubbles move in a more prescribed way starting from the bottom-middle and then radiating outward. Each iteration of the loop creates a new bubble with its own set of (mostly unique) values that get passed in as an argument to the constructor. What I specified manually earlier, I have some simple functions that do the work for me here. If you look at what the getXPosition, getYPosition, getSpeed, getBubbleRadius, getRotationRadius, and getColor functions do, they all simply return a random value that falls within a certain range. Let's look at the draw function next. As you saw earlier, this function repeatedly gets called every 20 milliseconds, and it is responsible for painting the background and telling each bubble to update its position. This update method is responsible for ensuring your Bubble's position and appearance is modified each time your draw method is called to create the animation that you see. As such, we'll spend a bit of time looking at its contents in great detail. This looks like a lot of code - and to a certain extent, it is. Before explaining this code, let's take a step back for a second. The end goal of everything you are doing is to draw a bubble. Each time the draw function is called, each bubble is drawn in a slightly different position. You repeat all of this once every 20 milliseconds, and you have an animation. All of the code you see above and will see analyzed shortly is about making sure these three properties are available to draw the bubble at the right location and size. Now that you know this, let's see how all of this code helps with that. All awesome animations have them. Well...at least this one does, and I hope you think it is awesome! An animation is a smooth change in some property value over a period of time. This "smooth change" is often handled by a handful of properties that are incremented by an amount. The counter property is incremented by 1 at each tick, and the angle is incremented by the value of the yIncrement property. You'll see the counter and angle properties used shortly when specifying the position of our bubble. All of this is just a simple manipulation of numbers. Notice that our incrementers counter and angle have made their first guest appearance. In the end, this code ensures our bubbles move up with a slight oscillation that gets bigger as the bubble goes further up. 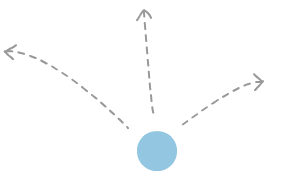 The currentX property stores the current horizontal position of the bubble. The sign property, like I mentioned earlier, specifies whether the bubble will move left or whether it will move right. Depending on what direction the bubble will be moving, you have a different mathematical expression for specifying the movement direction. Just like with the vertical case, I am just manipualating numbers to give the desired visual effect when everything is put together. Once the bubble's current position goes above a certain threshold, it's size is decreased ever so slightly. Remember, because this code gets called once every 20 milliseconds, "ever so slightly" can add up to something substantial. When a bubble is no longer visible, almost everything about it is reset so that it can start its journey all over again. The cases where we reset a bubble to a new beginning are when it becomes so small that it is virtually invisible, when it floats well beyond the top part of the canvas, or when it goes outside of either the left or right boundaries. These three cases are outlined in the code above, and in all of them, the resetPosition method is called to set our wayward bubble back on the right path. 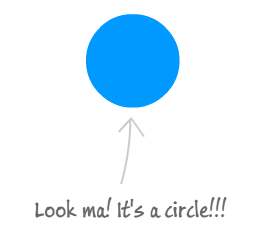 I've highlighted the two lines where the currentX, currentY, bubbleRadius, and color properties are used to actually draw what we are planning on drawing. To reiterate what I mentioned earlier, all of the work you've done is just to ensure these properties are set appropriately to draw your bubble in the right location. Well, that is all there is to it. Feel free to take my source code and make tweaks to it to create your own unique take on this animation. 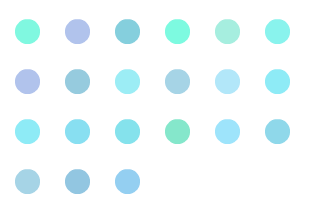 If you create something really cool, do share it in the Irritated Bubbles forum thread - a thread which I will watch like a hawk for cool examples!